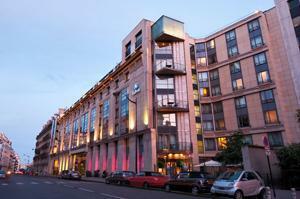 The L’Hôtel du Collectionneur hotel sits among iconic Paris landmarks, 10 minutes’ walk from the Champs-Élysées. Indulge in the mosaic-decorated spa or stroll the Andalusian Patio garden. Soak up Art Deco style at the Purple Bar or dine alfresco at Le Safran. The Executive Lounge offers sweeping Paris views. The four Collectionneur Meetings compliantrooms (which can be rearranged into six) located on the ground floor around the Andalousian Patio, all benefit from naturaldaylight.The Normandie, a luxurious 649 m²reception room, can be divided into7 smaller meeting rooms.It is situated next to a spacious 300 m² reception area, accessed by a magnificent staircase featuring intricate ornamental ironwork.This includes individuallycontrolled air conditioning, ergonomic seating, conference easel, whiteboard, automatically controlled screens, analogical phone lines, and more.